Toad Lilies (Tricyrtis): growing, planting, caring. Tricyrtis is a genus of Asian flowering plants in the lily family, with approximately 20 known species - commonly known as toad lilies. The genus has a native range from the Himalayas to eastern Asia and a few species are cultivated for their ornamental qualities in other parts of the world. A surprising flower, evoking both the lily and the orchid ! 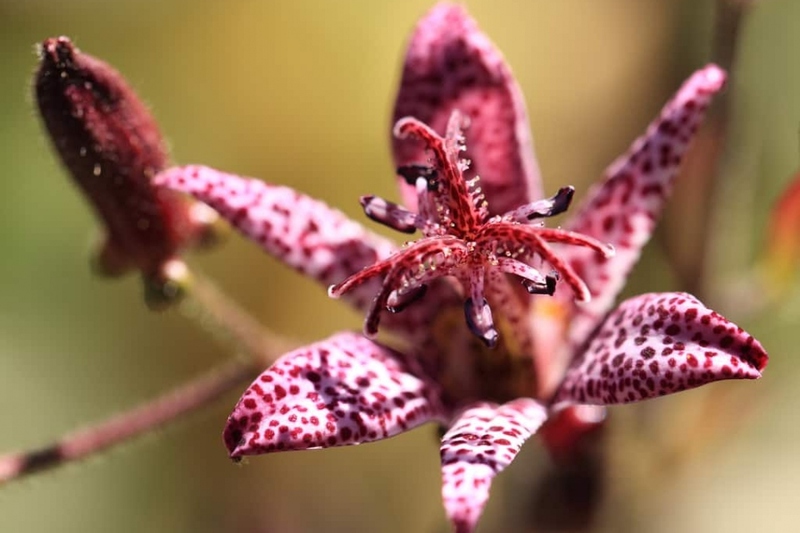 The tricyrtis genus includes several species and is part of the family Liliaceae - like the lily. The most common species in the garden is Tricyrtis hirta. This perennial plant reaches one meter in height, in the form of a tuft erected with a floral stem. The Tricyrtis grow well in the shade in a humid and rather acidic environment. Deciduous and alternate leaves have parallel veins - like those of hostas - and a lanceolate form. They bloom in the summer with flowers of 3 petals and 3 sepals generally speckled. This perennial plant native to Asia is one meter high, as a tuft erected above which grow unbloomed and branched flower stalks. Tricyrtis grow well in the shade in humid and rather acidic environment, they emit roots in order to widen progressively. The deciduous and alternate leaves have parallel veins - like those of the hostas - and a lanceolate form. The summer flowering is composed of flowers with 3 petals and 3 fleshy sepals and are often speckled, above which flourishes a column of floral pieces which includes the 6 stamens. Plant your tricyrtis in the fall or spring, in shade or semi shade, in rich soil rich in humus, acid and draining. In pot, add heathsoil, but no fertilizer. At the plantation, unravel the roots, and soak the rootball in water for a few minutes. In heavy soil, add heather or sand at the bottom of the hole. Plant without the base of the stems, and water. Watch your plantings in the first weeks, and in season, water your toad lilies in pots twice a week. Use non-calcareous water - prefer rainwater. Otherwise, if you planted in the shade in a damp corner, your tricyrtis will manage very well without you! Mulch twice a year, it is very important if you want to keep the soil a bit acid. Use a mulch that breaks down slowly, such as pine needles or barks, or ferns. If you have time, trim the dry flowers to prolong the bloom in the summer. Then, in early winter you can prune the dry foliage and turn it into mulching.